At Funtagious our private Function Hall is wired for sound and complete with dance lighting. It is equipped with booths and tables, and additional tables and chairs can be provided to accommodate groups of up to 50 guests. The hall is rented by the hour and outside food is allowed in the Function Hall. Rental includes attendant, sound system connection for your own music, and dance lighting. $100 - each additional hour. Dance parties with DJ, Kids Entertainer, Mike Pride. : Includes the Hall, Music, Contest, & Prizes for up to 50 Kids & Adults. $450 - for the first 2 hours. $150 - each additional hour. Note: The Host is responsible for all of the food, beverages, plates, napkins, utensils and decorations. At Funtagious we have a private game room full of interactive table games that can be rented by the hour. All games are set for free play for the entire rental duration. Games include: Air hockey, pool table, ping-pong table, basketball hoop, and Counter Attack table game! Note: No food or beverages are allowed in the game room on or near table games. 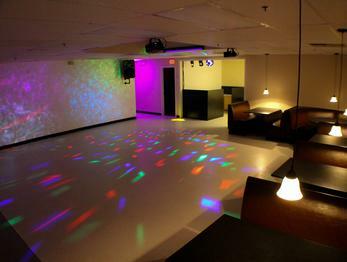 Discounted Flat Rate of $75/hour if rented together during the same time frame as the Function Hall. Absolutely No Open Lidless Cups for Drinks Allowed In The Function Hall or Game Room At Anytime. $150- Non Refundable Deposit Required and will be applied toward the total balance. $100 - Cleaning Deposit Required and will be applied toward the total balance (Only if) the seating, tables and floors are free of trash, food and debris. All plastic bottles and cans are emptied and placed into the recycling bin.